BRIAN HEAD – The Brian Head fire grew more than 10,000 acres overnight as the winds picked up and is spreading the fire toward Mammoth Creek, where officials say evacuations have begun. For the first time since the fire started Saturday, residents of Cedar City woke Friday morning to a smoke-filled valley as red flag warning conditions that included higher temperatures and gusty winds continued to fan the flames overnight. Late afternoon Thursday, the anticipated shift in winds caused more southeasterly growth, and by 10 p.m. the fire was reported to be approximately 17,000 acres; by Friday morning at 6 a.m. it had spread to 27,744 acres as prevailing winds continued to push the fire northeast. Evacuations in Mammoth Creek have been ordered, and the Red Cross continues to staff and operate a shelter at Panguitch High School following evacuation from Panguitch Lake. Sources say if the fire continues pushing in the same direction, Duck Creek could be in trouble as well. The fire also continued spreading down Clear Creek, and nine additional residences and six outbuildings were lost overnight. This brings the total number of structures lost to 13 residences and eight outbuildings. The fire is 5 percent contained, with most of that in the Brian Head area. While officials have come under pressure by several county commissioners to increase the incident management team to Type 1 instead of where it’s at now as an Incident Type 2, Ostler advised against that move. According to a previous Cedar City News report, incident management types depend upon four things: complexity level, resources required, risks associated with and duration of a fire. As these conditions increase, incident management types elevate from Type 5 to Type 1. Ostler also blamed the growing fire in part on the lack of logging that came to a halt 20 years ago resulting in the destruction of many of the trees by the bark beetle. “We have a mortality rate of 30 to 50 percent,” Ostler said. There is absolutely nothing more an Incident Type 1 team is going to be able to do. An Incident Type 1 team is not going to change the outcome of this fire. That dead and down wood in that forest is acting as a fuel source, and the fact is, when the federal government through environmental policy shut down logging that mountain became a tinderbox and a disaster waiting to happen and now we are facing the consequences. And it’s not just in Utah or on Cedar Mountain; it’s throughout the entire western United States. More resources continue to arrive on the fire, including additional experienced fire managers to meet the demands of a very challenging incident. “This staff builds the operational plan to best deploy resources and meet the objectives of safety, property protection, and ultimate containment of the fire,” a news release issued by Color Country Fire Interagency stated. A red flag warning has again been issued for today. As smoke continues to impact nearby communities, those who are sensitive to the smoke – including children and the elderly – should consult their health care physician for advice, limit time spent outdoors and avoid overexertion. Current evacuations– Additional evacuations have been issue today. Panguitch Lake, Horse Valley, Beaver Dam, Blue Springs, Rainbow Meadows, Mammoth Creek, Dry Lakes, Second Left Hand Canyon and the town of Brian Head are all under evacuation by local law enforcement. Evacuees can contact the Red Cross for shelter information. Closures – Highway 143 is closed from the cemetery in Parowan to milepost 50 outside of Panguitch. Mammoth Creek Road is closed at the junction with Highway 143. The north side gate of 143/148 is closed; however, Cedar Breaks National Monument is open with access via Highway 14. 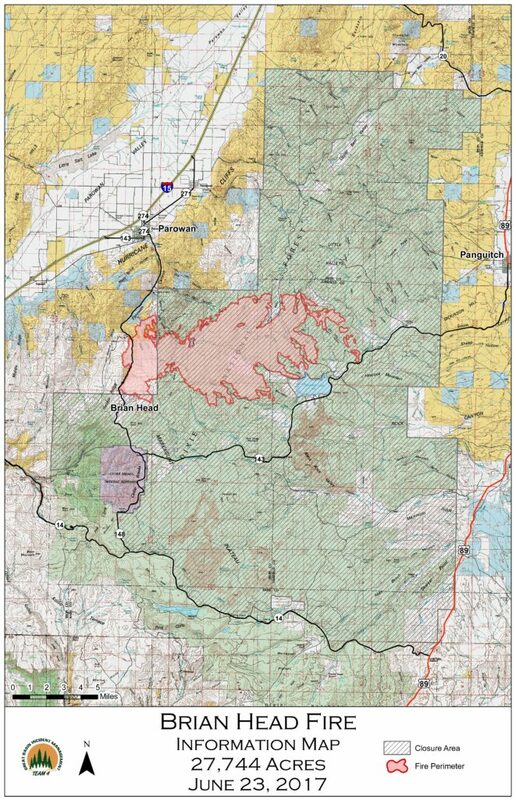 The Dixie National Forest has expanded its area closure. Please check your route before planning recreational activities. The Brian Head Fire started around midday Saturday, June 17, and grew very quickly through dense timber on lands administered by Brian Head Town, Iron County, in cooperation with the Utah Division of Forestry, Fire, and State Lands. It has since burned on to lands managed by Dixie National Forest and Color Country District Bureau of Land Management. Cedar Breaks National Monument remains open. Ready Set, Go Program: Website. Burn and closure maps: Website. Republican hacks never miss a chance to politicize a tragedy and throw shade on the “libruls”. Brett Ostler should know that the reason our mountain forests are tinderboxes is much more complex than some logging sales being canceled. If he doesn’t know, he has no business commenting. You can’t fix stupid. A fire torch to clear brush in the middle of June with temperatures in the 100s and no rain for about 2 months. In torchboy’s defense it seemed a little early in the year for a conflagration to start. That same week night-time temperatures were below freezing at Brian Head. It will be interesting to learn more details of how the fire started and if he had a burning permit. All of our Southern Utah mountain forests are tinderboxes primed for disaster. Dead fall and thick undergrowth everywhere. Dead and weakened trees from pine beetles. Higher average temperatures in both winter and summer. Over a century of fire suppression. Logging might have helped the situation to a small degree but much of the burned area is inaccessible to logging and the economics of logging for the areas that could be logged is marginal. Thing is….proper “management” would have taken care of this problem years ago. The extremist Enviro groups like SUWA are so worried about anything that looks like a road being made that they completely overlook everything else. What we truly “need” is “Moderation”. Back when temporary roads were pushed so that logging companies could properly extract the timber, the land looked better when they were through than it does the way they thin it today. If you don’t believe me, I invite you to go take a look in places like Lars Fork where its happening right now. Then Take a drive down towards Asay Knoll and Asay bench and the areas West up towards Mammoth Creek road and look at the forest in those areas…there is NOT thick undergrowth and deadfall everywhere. Why? Because it was thinned properly back in the 80’s…the very type of thinning which was stopped (By SUWA by suing to keep it locked up solid) up along the peak elevations where the bark beetle killed everything but the Aspens off and the trees were left to rot. What “common sense” says “Gee lets just let this infestation kill of the entire forest and then just let it lie in rot?? Anyone who lives here and knows anything about this area has been waiting for this to happen for years. Everyone I know talks about it and says the very same thing. Its truly amazing that we all seem so powerless to change things for the better. You talk about politicizing a tragedy? Look at what your Democratic Party officials are saying about the assassination attempt on Majority Whip Steve Scalise…..you’re nothing but HATERS. Are you just another right-wing loon? Thought you had more sense. Who cares what some obscure democrat volunteer says? You’re really reaching with this one. The guy, politically, is a nobody; it says he’s some kind of volunteer in nebraska. I’ll just say it, I was glad to see the scum get a taste of there own medicine. You wanna be as corrupt as they are you deserve what you get. I’d like to see a lot of them put in their place because they’re traitors to the people of this country–not necessarily violence, but held to account somehow. It seems all politicians are above the law in this country, and I’m not talkin about only repubs. That said, I don’t think random shootings like this will do any good in the long run and I’m against it, but when the scum got shot I could not feel the least bit bad. What would make you think I’m a Democrat Sedona? Anyone who criticizes right wing folly is automatically a Democrat? What in the world does this have to do with the Brian Head fire? You’re case in point for mindless politicalization. It is disturbing to see Mr. Ostler use this as an opportunity to push his political agenda. The fact is, a Type 1 Management Team is more capable of managing complex incidents, which the Brian Head fire has become. It is a little strange to see Ostler try to justify not ordering a Type 1 team; the complexity of the fire as well as the number of resources and severity of the situation clearly justify a Type 1 team. Why would you not want the most competent, capable organization possible to manage an incident like this in your state? This is the #1 priority fire in the US now, which means it will see an influx of resources beyond the scope of a Type 2 team to manage, and I would be very surprised if a Type 1 team isn’t ordered soon. The real reason Ostler doesn’t want it? Politics. The idea that the pine beetle spread because of lack of logging is pure hogwash, and is an incredibly easy idea to shoot holes in. First of all, logging still takes place on the mountain, and much of the fire is burning in country with low-quality fir that just isn’t lucrative to harvest. Oh my word! Someone actually talking sense. How are all the right-wing loons gonna blame the “libruls” and the “tree huggers” if this is the actual case? Amazing how all it takes is one fire to bring out all the right-wing clowns and nutters. Oh, and it should be noted, the fire started and spread initially on State land; land that the State of Utah is wholly responsible for managing and open for logging. Kind of hard to vilify the Federal Government for that. I think the Governor is worried about getting stuck with the bill. I find it funny that libs can make wild speculations about the results of conservatives on everything from global warming to gay marriage but when a conservative makes a statement about his perceived cause of an actual situation he is an idiot. We are forced into laws and regulations, all the time, because of the libs “fears”. Comments, grow up and get a job. You always seem to be here trying to get someone to listen to you. Maybe go adopt a cat that will listen. Do the rest of us a favor. comments: If you don’t like it here, in the land of conservatives, move back to California. There are lots of like minded people there. And POW! There he is, “if you don’t like it, then moooove” guy. We dun stole these here lands fair n square! I have called the fire management services and the Duck Creek Visitors Center, and this statement appears to be incorrect. The fire is progressing to the northeast, towards the town of Panguitch. That is in the opposite direction of Duck Creek with its campground and cabins. There may be some morning smoke in the valleys, but the fire is not threatening Duck Creek or anywhere on Highway 14. And they still opened the damn fireworks stands here all around the fire, yeah, just plain greed here folks, why hasn’t there been a ban on fireworks yet because of just what your all seeing…so next week another “accidental fire caused by someone letting their fireworks get out of hand”? ….enjoy the show, as your all letting this happen…. I contacted the Govenors office to complain about this, did you? The IDIOT who started this, is getting a lot of love on social media. A lot of the “locals”, will put ALL the blame on the “greenies”. Should more have been done to prevent this? Absolutely. A lot of the dead timber SHOULD have cleared. Is the guy who started this a complete moron who should at LEAST serve jail time? Absolutely. It was a stupid, stupid, move, to put it lightly. Anyone else see the irony in Ostler’s Statements as the fire started and was 100% on private land for about four days. Last time I checked, private land owners could “manage” or not manage their land as they see fit. Nice try! Well, when all these loons and nutters are presented with actual facts and can’t blame “the libruls” for every single thing they’ll simply curl up and hide. Well, they ordered a Type 1 team. Imagine that? Mr. Ostler is an idiot playing politics.